I wrote this Father's Day piece for Mamamia. It was done in my capacity as an employee of Sands - an organisation that offers peer support to parents whose babies have died. It's my story. Tearing off the wrapping paper to a pair of woollen socks or a six-pack of underwear will mean a lot to me on Sunday. It’s the first Father’s Day I get to enjoy as a dad, and I will revel in every minute of it. I’ll tell anyone who listens about the moment my son’s head first entered the world and how his eyes instantly locked onto mine. I’ll be milestone man for a day; proud to remember his first smile and to boast about him being the biggest boy at mother’s group. Last October my wife and I conceived for a third time. Relying on a three-stick policy of pregnancy confirmation, to say the affirmative result pleased us would be an understatement. We were buoyed by the news, and felt especially fortunate that my wife could get pregnant. Although we had endured two miscarriages, the positive tests lent us some permission to be excited, but I felt an overwhelming urge to keep my happiness in check. Before the first miscarriage, my wife and I had been trying to have a baby for six months. Our doctor shared with us all the dos and don’ts of getting pregnant. We cut the don’ts from our diet and did the dos like our lives depended on them. Our diligence proved our dedication to the cause, and showed each other we were committed. Learning we had succeeded the first time, I was on a high for days. I celebrated by buying parenting and names books. We told our families and friends. Biologically, I had fathered a fetus. But, significantly, in mind and emotion, I was a parent, a dad; our child was going to grow up fortunate – well-educated and part of a loving family. A fortnight later, the joy turned sour. Scans revealed that at eight weeks, our baby had died. It happens to one in five pregnancies, our obstetrician told us. I was angry for getting ahead of myself. We contributed to that alarming statistic again in August. Our third time we vowed not to talk names and I baulked at plotting our baby’s future. We would initially limit the people we told to those we could rely upon for support. As the pregnancy developed the more hopeful I got – I wanted a healthy baby but my hope was negative. I didn’t want anything bad to happen. At the half-way point, when my wife began feeling the baby’s kicks, her optimism soared. ‘This is the one,’ she would say to reassure me, but also because it’s what she believed. I tried desperately to mirror her confidence. But I found it difficult. I was convinced the ‘third-time-lucky’ theory wouldn’t apply to us. I urged myself not to be pessimistic. Doubting my baby’s ability made me feel guilty and embarrassed. 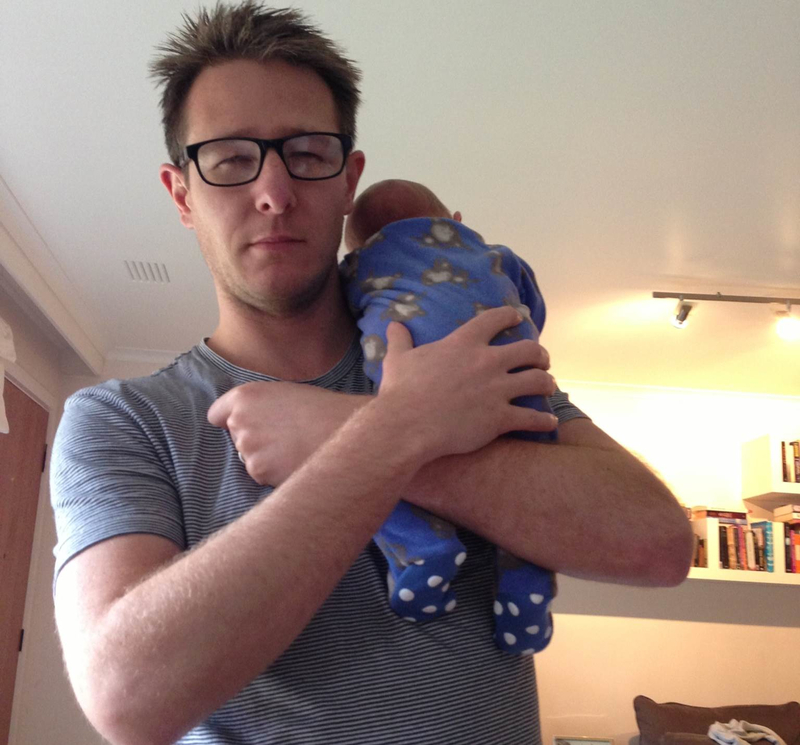 Thousands of Australian dads grapple with pregnancy loss. Every year, there are about 2000 stillbirths and 850 newborn deaths in Australia. In the majority of these cases, the causes are never known – there are 10 times more unexplained stillbirths than there are cot deaths. Often bereaved parents spend the rest of their lives wondering what went wrong. They should be celebrating Father’s Day too, but for many it is a day of mixed emotions. I know this year is different for me, and I can feel blessed to have a healthy baby to share it with. I will also wonder what might have been. So there is more to my Father’s Day than a gift I can wear. As well as celebrating the life I can enjoy with my son, I’ll remember the miscarriages my wife and I endured on our way and reflect on the emotional exhaustion of nine anxious months. But I’ll consider myself fortunate, for there are thousands of Australian fathers who never got to take their babies home. So, to all dads: Happy Father’s Day. This is such a moving post. I can't begin to imagine what it must be like to go through a miscarriage even once, never mind twice. I hope you had a great Fathers' Day. You're so right about it being a day that's about so much more than gifts like socks or whatever else, I really enjoyed experiencing my first Father's Day this year (...which was in June as I'm in the UK). Jonathan, thanks for commenting and visiting. I had a great day. It was the culmination of many agonising and emotional months, and I did think about that (a bit) but ultimately I had a great day with my own dad and my son.